As part of this campaign we have decided to start a series to highlight our portfolio organizations and how they are working to #AdvanceEquity. This week we will be highlighting Educators 4 Excellence. Educators 4 Excellence began as a group of New York City teachers who sought to alter the top-down approach to policy-making. Coming from diverse schools and backgrounds, the small group of teachers shared a common interest in wanting teachers' voices to shape the crucial decisions impacting their careers and classrooms. Since it's founding in 2010, thousands of teachers have signed the E4E Declaration, joining what is now a national community of teachers. As an organization, E4E works to support educators in serving as leaders both inside and outside the classroom. Through E4E, teachers work together to learn, network, and take action to better understand and influence education policies impacting their profession and students. Members leverage E4E’s weekly newsletter, blog, website, and teacher and partner networks as resources to learn about the latest education news and research. Regular events are held through E4E to help teachers build and learn from a supportive network of colleagues and education leaders across their districts. 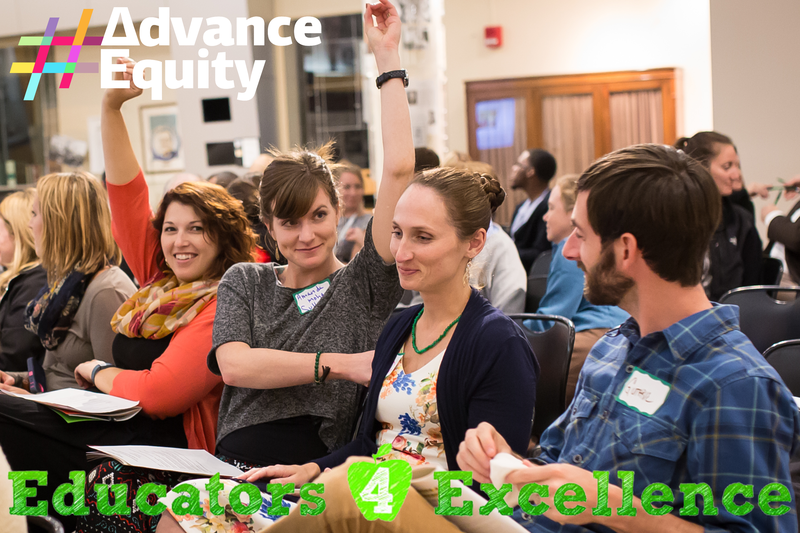 At the deepest level of engagement, E4E members take action to develop, author, and advocate for teacher-led policies to local, state, and federal leaders. To date, over 20,000 teachers across the country have joined E4E.